Many library positions will involve some element of instruction or demonstrating tools or resources. It’s likely that most will, when you think beyond formal instruction sessions and start to consider situations such as informal demonstrations of tools to colleagues or supervisors. This post is about one simple technique that can make instruction or demonstration a lot more memorable and often more fun: highlight a quirk or surprising result as part of your demonstration. As Liz recently pointed out, “teaching” comes in many forms throughout libraries, so this technique can be useful whether you’re showing something to a patron or a colleague. If you’d like further pursuasion, here’s a couple of influential essays on the instruction potential of talking about access tools or doing reference: James K. Elborg’s “Teaching at the Desk: Toward a Reference Pedagogy” and Barbara Fister’s “Teaching the Rhetorical Dimensions of Research”. So what sort of “quirks” seem to work best? From what I’ve observed in classes and watching presentations, the surprises can be unexpected results or unusual features. Either way, showing something that might delight or briefly perplex your audience can help to draw them in and start discussion. This means that it’s also a useful tool to gauge the level of your audience’s current understanding of the topic or use case. One example that helped me really recognize the power of this sort of “quirk” comes from Dr. John Walsh, a professor in Indiana University’s MLS program who often teaches courses on digital humanities and on comics and graphic novels. With that combination of courses, it’s perhaps no surprise that in the digital humanities course that I took with him, he introduced the concept of n-grams—charts that show the frequency with which a word occurs in a particular corpus over time—by using “batman.” Below is what the Google N-gram viewer returns with that search term (plus an annotation I added using Skitch). 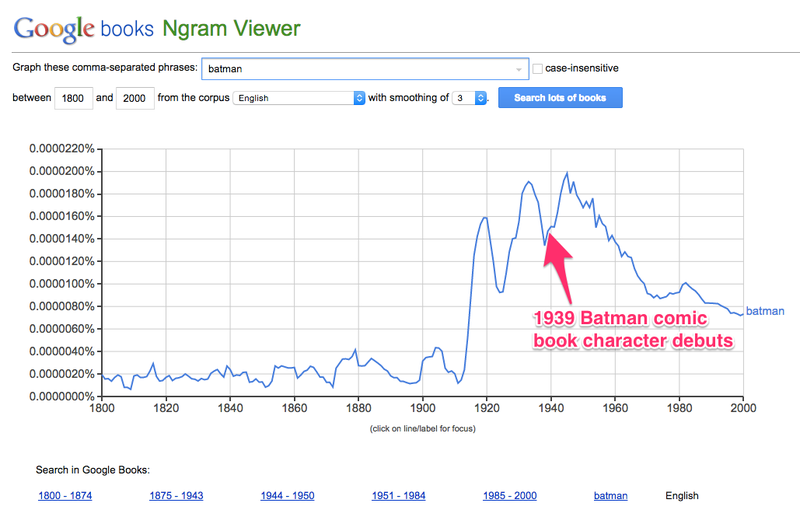 N-gram results for “Batman.” What’s with all those results before the Dark Knight debuted? The comic book character Batman debuted in 1939, yet there’s quite surprising frequency in the use of this word in previous years. What sorts of things might explain that? As this Wikipedia disambiguation page shows, the term “batman” can refer to a Turkish unit of mass, a military position, and various geographic features or regions throughout the world. For an even more astute interpretation of what might cause some of these results, there’s the possibility that the OCR (optical character recognition) software is misreading various fonts and substituting “batman” when that’s not the actual term used in the source material before it’s digitized. If you go ahead and click through to the Ngram links, you can also click on the year ranges at the bottom of the page to read some of the actual results. The same principle of demonstrating surprising features or results can be used at the reference desk. You can go beyond merely pointing patrons to resources and use quirks to briefly demonstrate how the tools work. Does a particular database let people limit results by facets such as format or year? Does this encyclopedia have related entries at the end of each entry? If you can think through the information need that a patron has and help them begin the process of using the tool, that’s a lot more useful than just handing it over. Showing them the process can include any sort of “gotchas” or snags to consider. If you’re looking for a simple technique to help liven up your instruction, why not try this out? It’s particularly nice to keep a few surprising terms like this up your sleeve to use when demonstrating a resource, whether this is in a one-shot instruction session, a database, an application, etc. I’ve found that things like “kismet,” “karma,” or other terms with both popular and specialized meanings can be ripe for engaging demonstrations of tools and resources. Instead of wracking your brain trying to find quirks to use, you might peruse the sub-Reddits for libraries, librarians, or Today I Learned. You might also ask on library Twitter during the various chats or hashtags. Alternatively, you can also always ask one of your library school instructors or local librarians if they have favorites along these lines. Do you already have interesting results or quirks of software you’d like to share? If so, the comments section awaits!